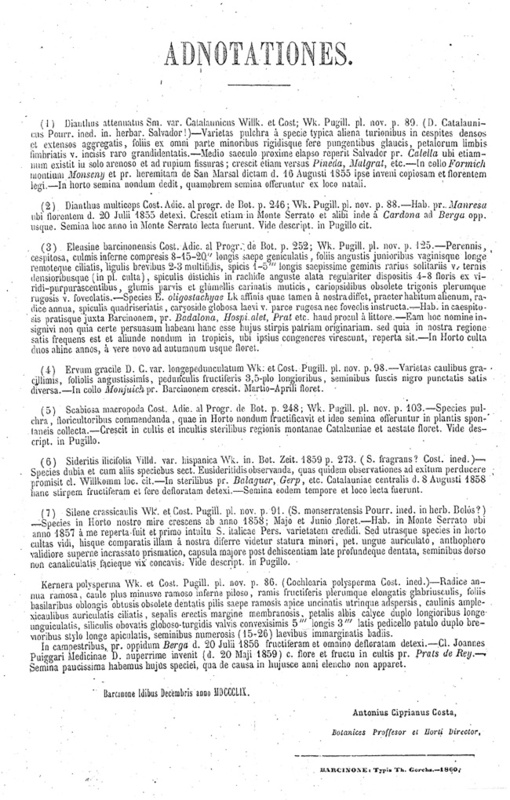 Index seminum in horto botanico archigymnasii Barcinonensis anno MDCCCLIX collectorum quae pro mutua communicatione offeruntur. Dianthus attenuatus Sm. var. catalaunicus Willk. et Cost. Dianthus multiceps Willk. ex Cost. Eleusine barcinonensis Willk. ex. Cost. Ervum gracile DC var. longepedunculatum Wk. et Cost. Kernera polysperma Wk. et Cost. Scabiosa macropoda Wk. ex Cost. Silene crassicaulis Wk. ex Cost.